With Dungeonbowl Knockout Edition discover an exclusive way to play Blood Bowl®, the brutally funny mix between fantasy and American Football, already adapted as a video game by Cyanide. Inspired by a famous tabletop game from Games Workshop, Dungeonbowl offers you a dangerous and crazy sport opposing two football teams, but also a deep tactical turn based game driven by dice. The key difference between Dungeonbowl and Blood Bowl as is rather obvious from the name, is that Dungeonbowl is played in a dungeon! The game also introduces some subtle modifications to the standard Blood Bowl rules. A match is still played between two teams, but each side is composed of three races. For example, the roster of a Rainbow Wizards team contains Wood Elves, Halflings and Humans. Dungeonbowl Knockout Edition features a total of 10 colleges of magic, which allows you to choose between a lot of different compositions! The second difference is that the first team to score a touchdown wins the match. This task is made significantly more difficult by the fact that the ball is hidden in one of six treasure chests, five of which are booby-trapped with an explosive spell. Last, but by no means least, movement within the dungeon is both facilitated and complicated by teleporter pads. These allow players to magically zap from one position to another; a mishap, however, can lead to a player being zapped out of the match. Dungeonbowl Knockout Edition allows you to challenge other players online but also to play single player against each college of Magic managed by the computer AI, with different levels of difficulty! Thanks to the in-game dungeon editor, you can build your own environment to play in. 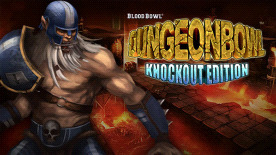 With Dungeonbowl Knockout Edition, you’ll be able to use a large variety of components including all the previous DLCs. Enjoy a myriad of maps and share your own dungeons with the whole community! Prepare some epic games with the new Dungeonbowl Knockout Edition! If you enjoy tactical games, sport and heroic fantasy, try Dungeonbowl now! NEW! Play against other players in competitives matches or against the computer AI. Build your own pitches in the game's dungeon editor and share it with the community. Use mixed teams made up of several races, from the Warhammer world. For players who have already bought an edition of Dungeonbowl, their version have been updated automatically so that they receive the Knockout Edition at no additional cost. Dungeonbowl: Knockout Edition © Copyright Games Workshop Limited 2014 Dungeonbowl, the Dungeon Bowl Knockout Edition logo, Blood Bowl, the Blood Bowl logo, GW, Games Workshop, Warhammer, and all associated logos, illustrations, images, names, creatures, races, vehicles, locations, weapons, characters, and the distinctive likeness thereof, are either ® or TM, and/or © Games Workshop Limited, variably registered around the world, and used under license. All rights reserved to their respective owners.